Adv. (Fr.) 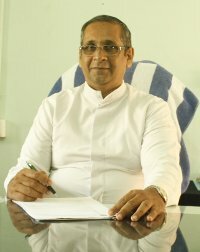 Pious Vachaparambil S. J. Welcome to St. Xavier’s College! Faith that does justice: The policies and programmes of a Jesuit institution give concrete witness to the faith that does justice. They give a counter-witness to the values of the consumer society. Value system and culture of college life encourage mutual respect; they promote the human dignity and human rights of each person, adult and young, in the educational community. Intellectual Formation: Intellectual formation includes mastery of basic humanistic and scientific disciplines through careful and sustained study that is based on competent and well-motivated teaching. This intellectual formation includes a growing ability to reason reflectively, logically, and critically. Creativity and Innovation: In Jesuit education, particular care is given to the development of the imaginative, the affective, and the creative dimensions of each student in all courses of study. These dimensions are essential in the formation of the whole person and are a way to discover God as he reveals himself through beauty. For these same reasons, Jesuit education includes opportunities for all students to come to an appreciation of literature, aesthetics, music and the fine arts. Physical Alertness: Jesuit education includes a well-developed programme of sports and physical education. In addition to strengthening the body, sports programmes help young men and women learn to accept both success and failure graciously; they become aware of the need to cooperate with others, using the best qualities of each individual to contribute to the greater advantage of the whole group. My wish and prayer for everyone who becomes part of the Xavier family is that he/she may groom in these noble ideals and may become effectively fruitful in life.